It was a rainy Sunday afternoon and the bandstand at Pickney Park was covered in tarps. This was supposed to be the site of the Rowayton Civic Association’s free Music in the park series, featuring master guitarist Frank Vignola and his trio, in a what was billed as an evening of gypsy jazz. The rain frightened off what should have been a nice crowd as it was unclear to many if the concert would go on. As it turns out the show was unceremoniously displaced into the compact auditorium of the Rowayton United Methodist Church across the street from the park. In this most intimate of settings, those who came were treated to an up close and personal concert from guitarist Frank Vignola, guitarist Vinny Raniolo and bassist Gary Mazzaroppi. Frank is a notable player having spent five years as a member of the venerable Les Paul’s trio. His guitar work crosses genres and has been heard on recordings with the likes of Wynton Marsalis, Donald Fagen ,Queen Latifa and even with the pop queen Madonna. The present trio recently released an album of music inspired by one of Frank’s guitar heroes, the great Django Reinhardt, aptly titled “100 years of Django” . It was mostly this music that was to be featured. In the stained glass lit setting of the church, the three musicians were dressed formally in jackets and ties, a surreal juxtaposition to the rain diminished audience of approximately twenty-five, who came for the most part in shorts and tee shirts. Frank is a smooth, precise, flat pick player who has an amazing facility to run arpeggios up and down his fret board in an effortless display of virtuosity. While he plays true to the gypsy style, his improvisations are infused with a decidedly blues based influence. “Stardust” which he later referred to as perhaps one of the greatest American songs ever written. True or not the trio performed it in ala the Quintete of the Hot Club of Paris style that set the stage of what was to come. He followed this with renditions of “Twilight Time” and then quickened the pace doing a double-time version of “Moonlight Serenade”. The trio plays with the well-oiled efficiency of a finely tuned machine; Frank taking the lead, Raniola and Mazzaroppi providing rhythmic pulse, with Mazzaroppi occasionally providing some pizzicato bass soling. As the group went into Richard Rodgers' “It Might As Well Be Spring” Frank suddenly stopped, as one of the audience obliviously came strolling in with a couple of boxes of steaming hot pizza. Frank joked about wanting a slice but it was clear this rude interruption was a distraction.The digressions unfortunately continued as a member of the audience allowed one of their children with a toy guitar to accompany Frank on stage. Cute at first, Frank and his trio were gracious beyond belief. As a father of four boys himself, he patiently encouraged the young boy to strum with them on a tune. The hapless parents should have extended the musicians the courtesy of sitting their son down after one song so as not to distract from the remaining performance, instead the side show lasted through several songs. At one point, talking in the rear was so distracting that a fellow musician had to go back to tell the people to quiet down. Embarrassingly it seems that even in wealthy enclaves like Rowayton too many people are oblivious to their own disrespectful behavior. As you can tell by the diversity of the music this group can play to an audience. Because of the informal nature of the setting and the compactness of the audience Frank entertained some requests. My personal favorites were his rendition of the classic “Stella by Starlight”, which he played in a way that reminded me of Joe Pass’s style and their wonderful version of Cole Porter’s “ Night and Day”. Frank performed a couple of Henry Mancini tunes, the wistful “Moon River” and the playful “Theme to the Pink Panther”. The trio wowed the audience with their tremendous facility on a furiously paced “Flight of the Bumblebee”. FRANK VIGNOLA "FLIGHT OF THE BUMBLE BEE "
Despite the distractions and the poor rain-influenced showing it was a wonderful opportunity to see Frank Vignola and his trio up close and personal. The Rowayton Civic Association and their generous sponsors should be commended for providing free access to talented musical performers like the Frank Vignola Trio. Frank is a tremendous player and from what I witnessed a most gracious person. Hopefully next time he is in Connecticut he will be playing in front of a larger and more appreciative audience.He deserves it. 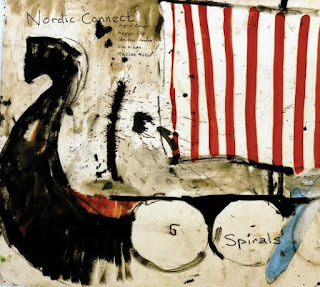 Viking Quest: Review of Nordic Connect's "Spirals"
With the blood of Vikings running through their ancestral veins, Nordic Connect presents a challenging and inspired musical performance on their latest Artist Share release “Spirals”. The front line is made up of the Jensen sisters, Ingrid on trumpet and Christine on saxophones, who hail from the Canadian Northwest. 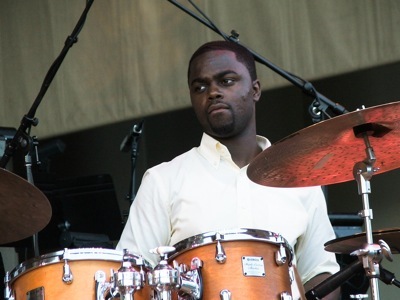 The drummer John Wikan, an American who was born in Alaska. 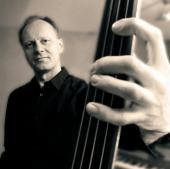 Only bassist Mattias Welin and pianist Maggi Olin ,who are Swedish born, are first generation Scandinavians. On "Spiral”, the music is challenging and harmonically full of surprises. Though atmospheric at times, the music essentially always retains some semblance of a melodic core throughout. Ingrid Jensen is a player who can soar on her trumpet with consummate ease and fluid grace. As an important member of the Maria Schneider Orchestra she is no stranger to challenging music. She has great command of her instrument usually choosing to play within the music, with little fanfare or grand standing despite her considerable virtuosity. She is adept at the use of electronics, adding an additional layer of texture to her music where she feels it is appropriate. On “Spiral” she combines with her sister Christine, an accomplished saxophonist in her own right, to form a front line that plays with a masterful simpatico that only comes from years of familiarity. On Maggi Olin’s serene “Travel Fever” the music slowly allows you to enter into a labyrinth of sounds as each instrument in the ensemble is introduced into the song. The band successfully build more and more interest, steadily adding layers of harmonic complexity on top of the forward moving rhythm with Wikan’s brushed traps keeping time. It is this layering of sounds that captivates the listener’s attention. “Song for Inga” is a waltz-like composition that alternates between soft pianissimo breaking into more aggressive fortissimo passages where Ingrid takes extended solos on her trumpet.Wikan crashes his cymbals to punctuate the change. Ingrid is given the freedom to solo in a wonderfully expressive series of measures. It is here she slowly reveals her virtuosity, her sure tone and her range of expression. She can deliver rapid-fire bursts in triple tongue that are bright and free of noise, cleanly building to a apex before her sister Christine enters in on her serpentine soprano over the pulsing rhythm section. 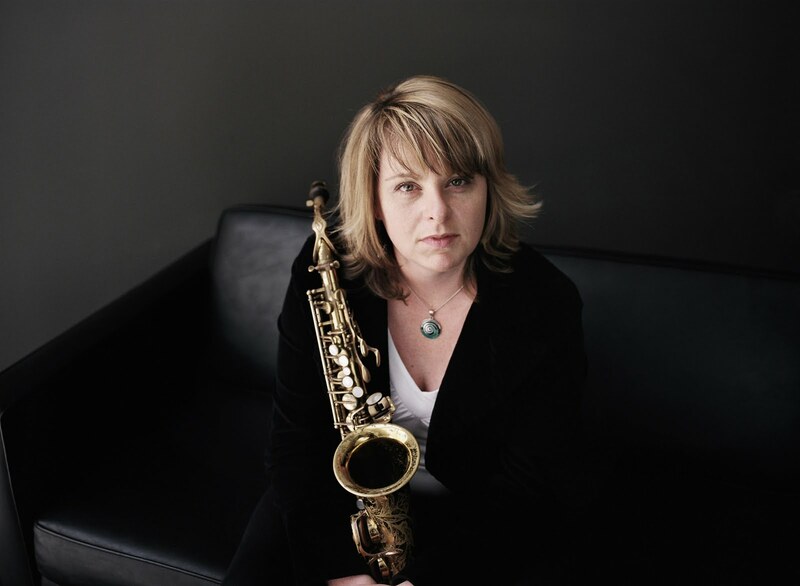 Ingrid Jensen’s “Earth Signs”, has a sound derivative of seventies Miles Davis, and is a combination of atmospherics laced with a sampling of funk..
Christine Jensen’s “Castle Mountain” has a rhythmic groove that features her on some darting, Shorter-esque soprano saxophone. Olin’s Fender Rhodes has an airy, distinctively seventies sound. Welin and Wikan keep time, as the front line play precisely in tandem. Wikam adds some percussive interest over the relentless beat maintained by Welin and Olin. It is the tasteful interplay that works so well to create this cohesive musical statement. On “M-oving” Ingrid’s trumpet is muted. The distinctive compressive sound works well with Olin’s gracefully light piano. Jensen introduces the barest traces of electronics to her trumpet at the coda. The wistful “Yew” is a mellow composition that laces Christine’s soprano with what sounds like Ingrid’s flugelhorn, which she later switches to a muted trumpet. “66 Mike” features the two Jensen sisters playing in a duet that reminds me at times of the fine ensemble work of Jamie Baum’s recent group on “Solace”. Ingrid’s trumpet has an airy quality to it that is accentuated by Olin’s effective use of the Fender Rhodes. “Ballad North” has a somber, processional -like quality to it. “Brejk a leg” starts out with a some electronic enhancements that are actuated by Jensen’s trumpet. Christine and Ingrid alternate lines on sax and trumpet and then join in a duet through a series of twisting lines. The song then breaks into a syncopated rhythmic groove that features Olin, Welin and Wikam, while Jensen intersperses tasty trumpet lines over the top. “Spirals” offers the listener a series of flawlessly executed compositions that feature some fine individual performannce. It plays as a mostly unified example of fine, postmodern jazz ensemble music. Ingrid Jensen’s articulate trumpet solos, are a particular delight. Musicians: Ingrid Jensen (trumpet, flugelhorn & electronics); Christine Jensen (Alto and soprano saxophones); Maggi Olin (Piano and Rhodes); Mattias Welin (Acoustic Bass); Jon Wikan (drums, cajon & percussion). The soon to be thirty, Walter Smith III is a maturing voice on tenor saxophone who seems to be at his best when in the accompaniment of a fine trumpet player. 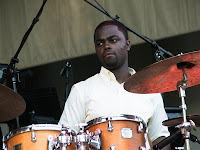 He has front lined with some notables including the prolific Terrence Blanchard, as well as the up and coming Christian Scott, and the fiery Sean Jones all with laudable results, but it is with the prodigious Ambrose Akinmusire where he seems to have found a true kindred spirit. On “Live in Paris” , Smith’s second album as a leader, the interplay with Akinmusire is visceral and palpably energetic. This set was recorded in July of 2008 in the club Sunset-Sunside in Paris and subsequently was released in October 2009. Ben Ratliff of the New York Times did a favorable review back in March of this year (click here to read Ratliff’s review). A friend recently turned me on to this powerful performance. The opening salvo, “Blues” is an extended session on the blues with some fine individual moments On the introduction Smith delves deeply into a thoughtful solo exploration on his tenor. He has a strong, clear, deep-throated tone. He creates his own landscape of sounds, using a combination of slowly brewed tonal ideas that he intersperses with rapid crescendos of free flowing notes. He and Akinmusire take a brief but rousing duet at the head, showing a strong, unified symbiosis that has roots in some of the stellar sax/trumpet front lines of Art Blakey’s Jazz Messengers but with a modern edge. This band is a fully integrated unit that plays with the precision of a Swiss timepiece. Ambrose Akinmusire’s trumpet is beautifully emotive on this cd. He employs soft, demurred passages, slickly slurred lines and poignant punctuations that show great sensitivity and impeccable timing. It is hard to say who spurs on whom on this frontline since both Smith and Akinmusire seem to be invigorated by each other’s solo work. 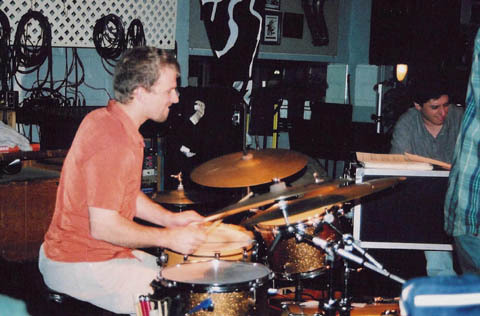 The rhythm section is an essential part of this wonderful chemistry. Aaron Goldberg has a tremendous ear for picking up fragments of ideas from his fellow musicians and expanding on them. He uses these fleeting thoughts to prod both Smith and Akinmusire in a continuous flow of rapid-fire dialogue and as a source of inspiration for his own solo explorations. An introductory solo by Matt Brewer aptly titled “Bass Solo” leads into the breezy “Aroca”. 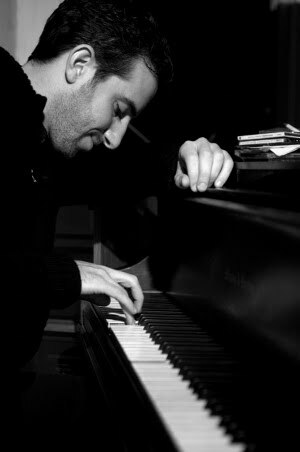 Aaron Goldberg’s solo work is particularly lyrical and moving as he dances with a light touch that has a crystalline quality at times. Smith takes this cue during his own thoughtful solo, undulating his way through the armature of the song like the gentle ebb and flow of an incoming tide. Akinmusire’s solo is a model of restraint, deftly accompanied by Brewer and Marcus Gilmore’s timely accents. Another highlight is the group’s take on Benny Golson’s “Stablemates”. The song’s jagged lines offer the two frontline horns a chance to do a bit of a dance around each other before they each go solo. Akinmusire muses over Brewer’s wandering bass lines. Smith takes flight with a fluid tenor solo before Goldberg adds a magical interlude that sets the stage for some wonderful conversational work between the three members of this potent rhythm section. Goldberg starts the intoxicating sway of the rhythm on “Shed” on solo piano before the frontline play the exotic melody in unison. Smith is at his most sensual here using delicate slurs and sonorous screeches to accentuate the anguish he feels from the melody line. The inventive Goldberg takes you on his own journey maintaining the ostinato of the bass line with his left hand as his right hand flourishes off a series of unexpected sidebars. Akinmusire enters using thoughtful, measured phrases that glide across the melody, slowly building tension with ever increasing intensity in a sustained, controlled manner. He chooses not to use firebrand pyrotechnics on his trumpet (more Miles than Freddie) but is nonetheless very effective. The final song of the set is Sam Rivers' “Cyclic Episode” which has become a staple of Smith’s repertoire. 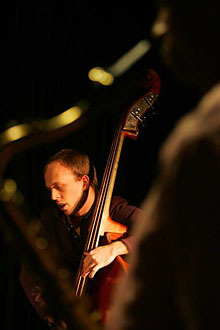 The driving force of Brewer and Gilmore create the atmosphere where Goldberg, Smith and Akinmusire can shine during their individual solos. Smith is particularly flowing here with Gilmore spurring him on with timely crashes and rolls. This is a top notch ensemble that has the magic of great chemistry on their side. Hopefully we will be able to hear more from them while the magic is still alive.. 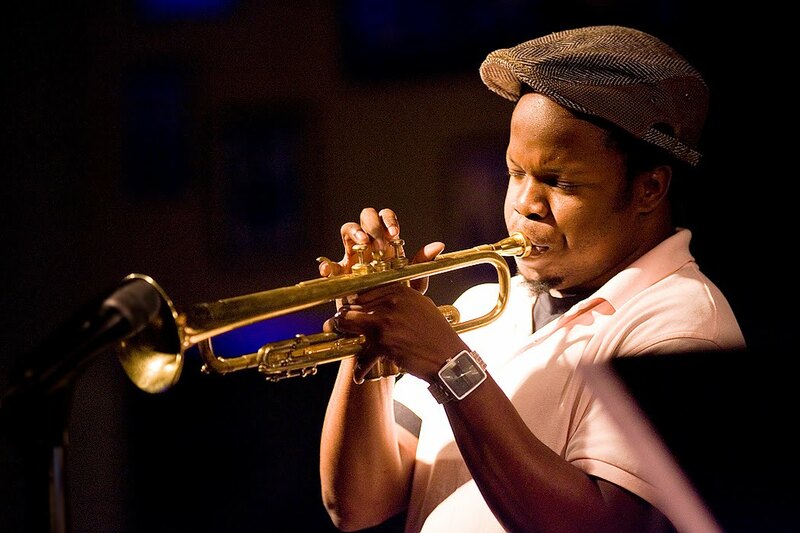 Musicians: Walter Smith III (tenor saxophone), Ambrose Akinmusire (trumpet), Aaron Goldberg (piano), Matt Brewer ( bass), Marcus Gilmore (drums).